Preheat your oven to 375. Press your tofu to remove water, then cube and bake on parchment paper for 20 minutes. Meanwhile, chop your bok choy, red onion, peppers, and if needed rice the cauliflower. Mix your Hoisin, chili garlic, peanut putter, and soy sauce in a bowl. Grate some fresh ginger into the bowl and whisk. Remove your tofu from the oven, then place in a bowl. Put half the sauce on the tofu. Meanwhile, place your veggies in a cast iron with a splash of sesame oil and the other half of the sauce. Sauté veggies about 5 minutes, then add tofu and warm, about 5-7 more minutes. 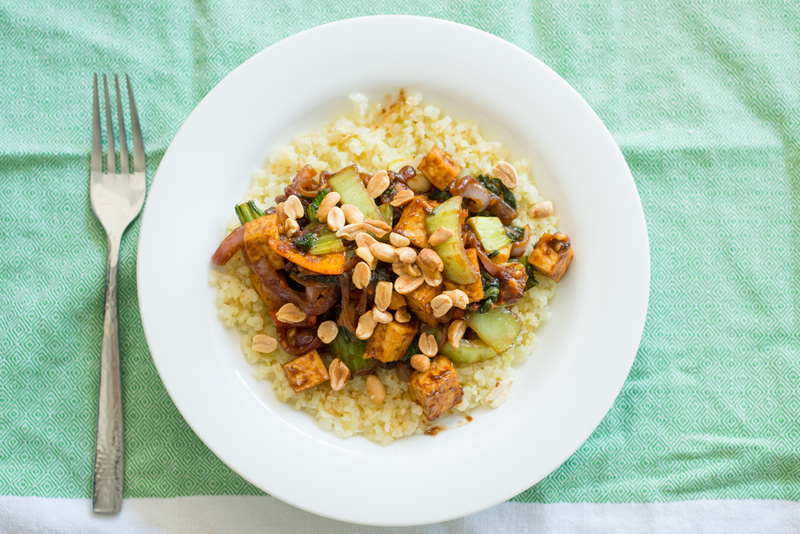 Serve veggies and tofu over cauliflower rice, then top with more ginger and peanuts. Categories: Main Courses, Recipe, Vegetarian Tags: bok choy, cauliflower, cauliflower rice, chili garlic sauce, dinner, ginger, hoisin sauce, olive oil, onion, peanut butter, peanuts, red onino, sesame oil, soy sauce, sweet peppers, tofu, vegetarian. permalink.